It’s that time of the year again, girls & ghouls. 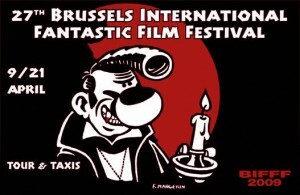 On the 9th of April the 27th edition of the Brussels International Fantastic Film Festival will kick off two weeks of horrifying mayhem at the Tour & Taxis location. The traditional cocktail of new releases in the field of Horror, Sci-Fi, Fantasy and all possible related subgenres will be present again. Estimated roughly, we’re talking over 60 films, in and out of competition, short films and other events. Be prepared to wield your way through the Good, the Bad and the Very Ugly to find those hidden gems. Things might get a little bloody. You have been warned. Are you up for the challenge, or just curious like that one little cat that got killed because of it? 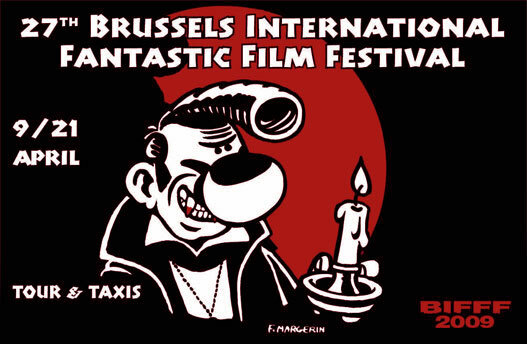 Then visit BIFFF’s official website for a complete overview of this year’s program. Watch this page for updates. 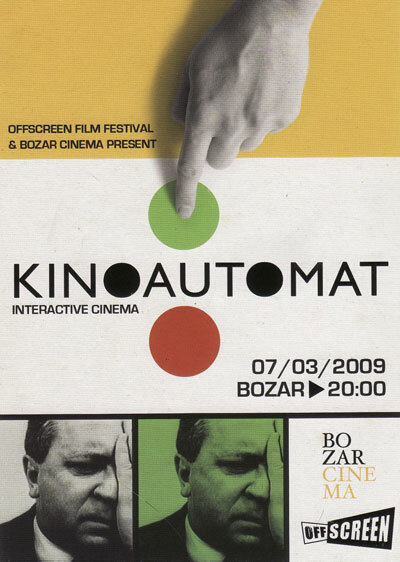 Kinoautomat is the first interactive movie whose plot and story are fully determined by the viewers. First shown during the world exhibition of 1967 in Montréal, “One Man and His House” was written and directed by members of the Czech new wave cinema as an effective satire of democracy. 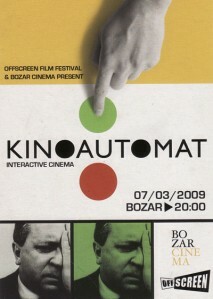 This, at the time, unique project allows the viewers to decide the course of events in the film by means of voting buttons. Now, forty years later, the project has been restored for new viewing purposes. Offscreen Film festival, in collaboration with Bozar Cinema and the Czech Centre of Brussels will present this artistic hybrid, crossing film and performance, to Belgian audiences. Be part of it on the 7th of March. More info, plot synopsis and new trailer can be found here. Kinoautomat is part of Offscreen’s Interactive Cinema module, which also schedules a symposium on the phenomena, a tribute to William Castle and more. 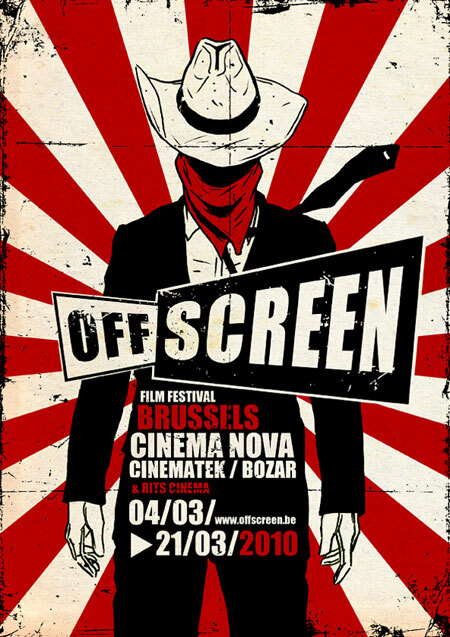 The good people behind Offscreen – a Brussels film festival where the emphasis lies on unusual, groundbreaking and offbeat filmgenres from around the world – are about to kick off the festival’s 2nd edition. This extravagant cinematic experience will take place between the 5th and the 22nd of March 2009. 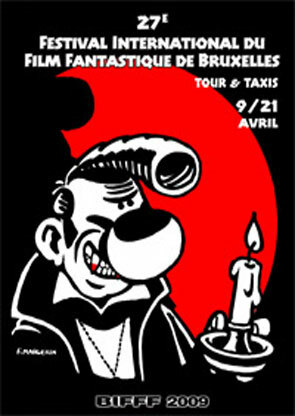 From older, almost obscure gems to avant-premières, all films will be scheduled and presented in four theme-related modules (Giallo! Post-Apo!, William Castle! etc.). 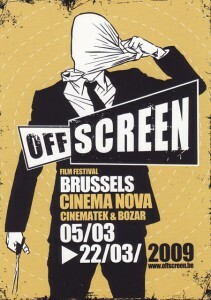 For more info, please visit the Offscreen website. The complete program will be announced next week. 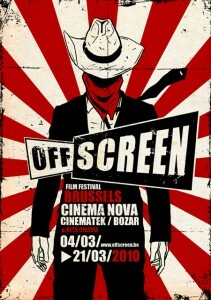 A year has come & gone and Offscreen Film Festival is ready to kick off the third edition of their annual festivities. From the 4th of March to the 21st, this year’s program will again take you on a voyage across extravagant cinematographic landscapes. A trip down Japanese, European & Italian genre cinema from past days as well as an introduction to some freshly released films from today’s world cinema. 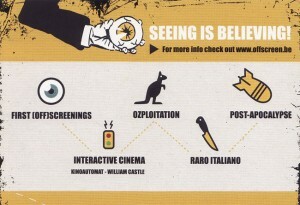 In this news flash you’ll find the trailer of this year’s edition, a blurb from Offscreen’s website explaining briefly what all you can expect and to get your cinephilic juices flowing, we’ve compiled a photo gallery with some poster art & movie stills all related to the films on Offscreen’s 2010 program. Images often say more than words, so we’ll leave it at that. Now proceed and go click on some things below… and be amazed!